Premier League week 3: What have we learnt? | Football: The Beautiful Game. Home › Football › Premier League week 3: What have we learnt? Premier League week 3: What have we learnt? Arsenal’s 1-0 North London Derby win rounded off the third week of Premier League fixtures which saw Liverpool move to the top of the league. What can be learnt from this weekend as the season starts to get into full flow? A weekend which started off on Saturday lunch time as a less than impressive Manchester City narrowly edge past newly promoted Hull City at the Emirates. The 2-0 scoreline flattered the Manchester club as Hull spurned a number of chances as first Aluko stabbed wide after being put through one on one and Danny Graham seeing a goal ruled out for offside. Despite the scoreline, Steve Bruce will be a happy manager after an impressive performance. In the headline game of the weekend, Arsenal beat Spurs 1-0 in the North London derby with Oliver Giroud scoring the only goal of the game and his 3rd in as many Premier League games. Much has been made about the lack of money spent by Arsene Wenger with many tipping them to miss out on the top four at the expense of their rivals but his side showed on Sunday they can still compete and with or without signings will still be there or there abouts come May. Spurs will be disappointed but AVB will understand that his newly built side will take time to gel. Their lack of attacking threat shouldn’t be of too much concern with Eriksen still to come in and Lamela yet to make his first start. Another Sunday game saw Liverpool defeat Manchester United by the same scoreline. Doubts are already being cast over David Moyes but it was always going to be tough job replacing Ferguson and there was always going to be a transitional phase. What will disappoint Moyes the most was the lackluster performance of the midfield. Questions have to be asked of why Shinji Kagawa didn’t feature at all in the match day squad as Moyes looks to strengthen his midfield. Liverpool were impressive as they notched up their third straight 1-0 win courtesy of Daniel Sturridge’s goal, again. They never looked like being broken down at the back and Brendan Rodgers side, the only to have obtained maximum points so far, are looking more and more like Champions League contenders. Elsewhere new boys Crystal Palace beat Sunderland 3-1 at Selhurst Park thanks to goals from Danny Gabbidon, Dwight Gayle and Stuart O’Keefe gave the London club their first win of the season. The win shows Palace can compete and score goals at home, something which will be vital if they are to stay up. For Sunderland on the other hand, things look bleak. A woeful performance, littered with mistakes, followed by a melt down by manager Paulo di Canio after the game will leave fans of the North East club wondering which direction the club will go this year. One positive was the goal scoring return of key man Steven Fletcher. There were also first wins of the season for Norwich City and Newcastle United both winning 1-0 at home against Southampton and Fulham respectively. Young star Nathan Redmond lit up the pitch for Norwich whilst Hatem Ben Arfa scored a cracking late goal, Newcastle’s first of the season to move them both onto four points. Both Southampton and Fulham will be disappointed with the lack of chances they created but will not be too disheartened after decent performances. Another team to grab their first win were Swansea after they beat bottom of the table, yes it is early, West Brom 2-0 at the Hawthorns. Swansea have had tough opening fixtures and the win shows their potential to do well this season whilst West Brom fans will be feeling rather nervous after a poor performance today, and just one point to their name. Fans are also concerned about the lack of money being spent on the playing club, not one penny has been spent of transfer fee’s. Stoke make it two wins out of three following a 1-0 away win at West Ham courtesy of a Jermaine Pennant free kick, an encouraging start for Mark Hughes who seems to have got his side starting to pass whilst maintaining their solid core at the back. 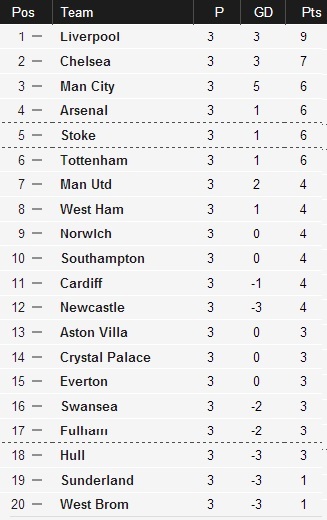 West Ham won’t worry too much having picked up 4 points from their opening two fixtures. Finally, Cardiff and Everton played out a 0-0 draw in Wales. Cardiff will be pleased with their first clean sheet of the season and can count themselves lucky after Everton were denied a stone wall penalty following a foul on Leighton Baines. Everton fans will be scratching their heads after 3 successive draws, with none of their attacking players yet to find the net. Two clean sheets in a row will be encouraging for the club though, with many wondering about Martinez’s ability to build a solid team. Have to say, one of the worst weekends of football I have seen in a long while in the Premier League. Truly awful.